July | 2016 | Syed Jahanzaib Personal Blog to Share Knowledge ! Following is an bash script to monitor data center temperature via SNMP query from Emerson 10kva UPS with web snmp card installed. We can monitor the temperature via manageable ups builtin feature as well, but I required some customization so I enabled the SNMP feature in ups web card and made following Linux bash script to do the tasks. I am sharing it for general public as an example. 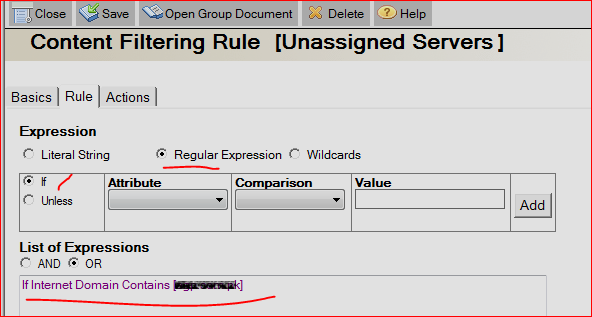 Following is an example code of SNMP query of temperature monitor from Emerson UPS ITA 10k UPS. [Sensor IRM-S02TH-001]. First we will inquire the UPS by snmpwalk query to confirm the OID and response. # Scheduled Script to check data center temperature via SNMP after every 5 minutes. # In this example we are using Emerson 10kva UPS with web snmp card attached to the network. # but it iwll not repeat the sending alert untill next status change. echo "Checking UPS interface ping ..."
echo "ALERT ! UPS IP $UPSIP is DOWN ..."
echo -e "UPS Ping $COL_GREEN OK $COL_RESET ." echo -e "$COL_RED Unable to get any Numerical digit via SNMP Query therefore Exiting , SNMP nor working? check .... $COL_RESET"
HIGHMSG="Data Center Temperature is above $TEMPFINAL c / Humidity = $HUMIDFINAL %"
OKMSG="Data Center Temperature is now OK below $TEMPFINAL c / Humidity = $HUMIDFINAL %"
echo -e "Maximum Temperature Allowed = $COL_GREEN $TEMPLIMIT c $COL_RESET"
#Current Temperature = $COL_RED $TEMPFINAL c$COL_RESET"
echo -e "Current Temperature = $COL_RED $TEMPFINAL / Humidity = $HUMIDFINAL %$COL_RESET"
echo -e "Current Temperature = $COL_GREEN $TEMPFINAL c / Humidity = $HUMIDFINAL %$COL_RESET"
echo -e "$COL_RED $HIGHMSG $COL_RESET"
echo -e "$COL_RED SMS/Email have already been sent $COL_RESET"
echo -e "$COL_RED ALERT: $HIGHMSG $(date) / SENDING SMS/Email .... $COL_RESET"
echo -e "$COL_GREEN $OKMSG ... $COL_RESET"
echo -e "$COL_GREEN $COMPANY ALERT : $HEADING $OKMSG $(date) / SENDING SMS/Email .... $COL_RESET"
In our company, we have IBM Lotus Domino Mail Server which i managed myself. Getting Lotus Domino support is quite a tough job, especially if you dont have any support SLA with the IBM, which generally costs heavy amount in $. Therefore I have to manage things on my own mostly using google and with some common sense lol. Today we received an email from a valid client, and when we tried to copy or reply him with history, we receive following error. It also happens if user have selected following in mail delivery options. Without going in much details (which is already available in greater details on the internet), here is how I managed to sort it. Open user mail file via Domino Admin Client. Save it with any name like “remove keep private” and exit. Now goto Action / and you will see the newly created agent name. click on it. We have a routerboard which have 2 wan pppoe-outX dialers. Gmail account is configured to send alerts. On the same LAN we have KANNEL sms gateway server which acts as a central sms gateway for sending receiving sms. The script is designed for some specific network, it may not fit general public requirements, but still its a good idea to collect various scripting ideas for learning purposes and it may help in other tasks as well. If the Router is rebooted , it should send us Email and SMS with the new WAN ip addresses. It should check for UPTIME , if the UPTIME is less than X Minutes, then it should consider the RB is actually rebooted, this check was required to prevent false detection of reboot. In some ROS, it was a bug that the RB doesn’t gets rebooted but reload the OS and the scripts consider that the RB got rebooted while it actually dont. so this check need to be added. 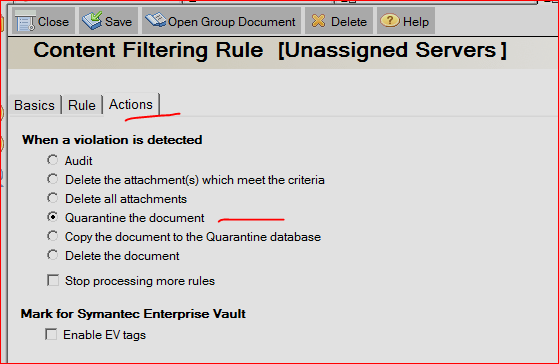 Make sure you have already configured the /tools/emails section in RB to make email alerts work. 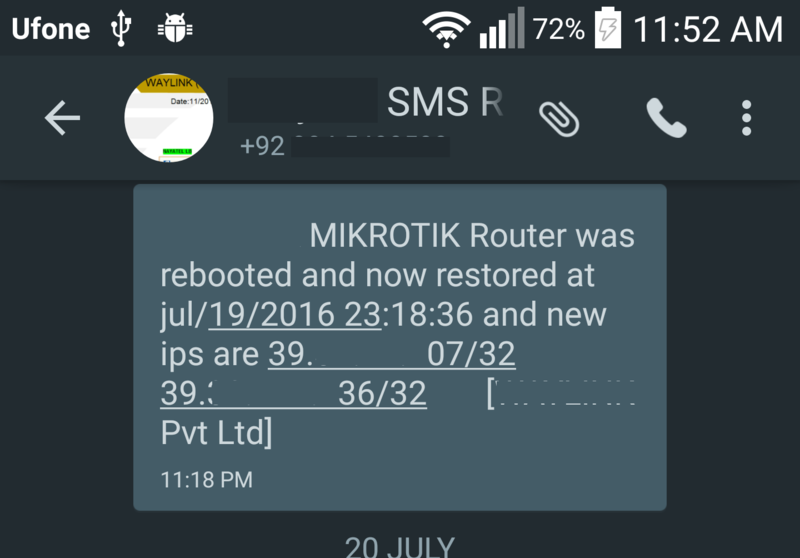 :local es "$[/system identity get name] $[/system clock get date] $[/system clock get time] $COMPANY MIKROTIK got rebooted ! new ips $WAN1IP $WAN2IP and Uptime is $UPTIME"
:local eb "$[/system identity get name] $[/system clock get date] $[/system clock get time] $COMPANY MIKROTIK got rebooted ! \nNew ip address are \n WAN1IP = $WAN1IP \n WAN2IP = $WAN2IP \n\n Current Uptime is $UPTIME \n\n This script is powered by SYED JAHANZAIB !" :log warning "Email Done! 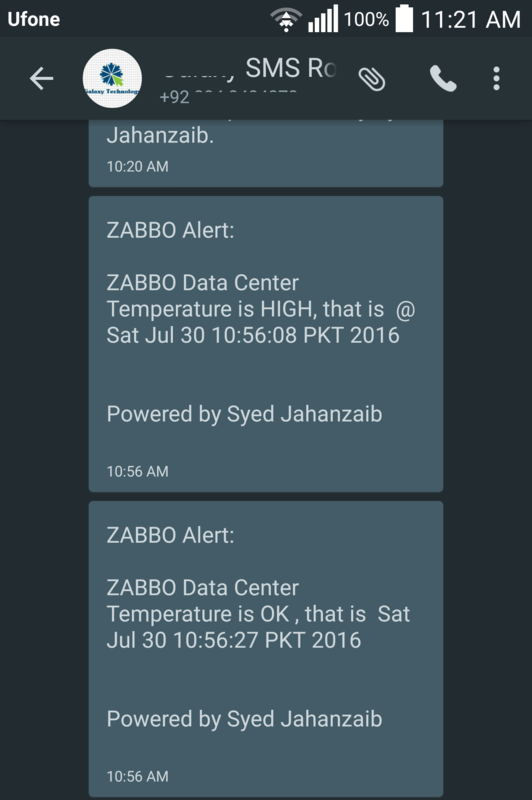 for REBOOT ..."
:log warning "SENDING SMS FOR REBOOT ALERT VIA KANNEL RADIUS GATEWAY ." # if uptime is above then uptime limit threshold value, then no need to send SMS, this is to prevent false alarm. 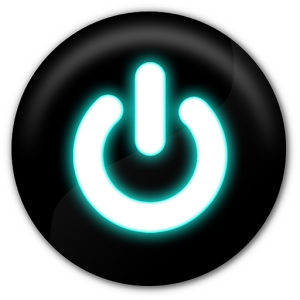 :log error "System is above then $UPTIMELIMIT, so no need to send reboot sms/email alert!" We are using Symantec IBM lotus Domino as our mailing system for inbound/outbound emails & Symantec Mail Security as anti-spam mechanism. Managing heavily used production email server & fighting with the spam is a really tough job to do and requires continuous monitoring and most times requires additional work to do on regular basis. From past few days, our email users were receiving lot of spoofed (faked advertisement / malware) emails pretending to be coming from there own email address and sometimes other legitimate users as well.. Subject was different every time , and source was dynamic too in the header. It was really annoying as user does not wants to block his email address in filters. E-mail spoofing is the forgery of an e-mail header so that the message appears to have originated from someone or somewhere other than the actual source. Example you can receive email pretending to be coming from your own email address, strange and annoying as well too. Adding SPF record is a good idea and every mail server mx record should have it. However I took another route which is a kind of workaround BUT at least it’s working amazingly good for me !. 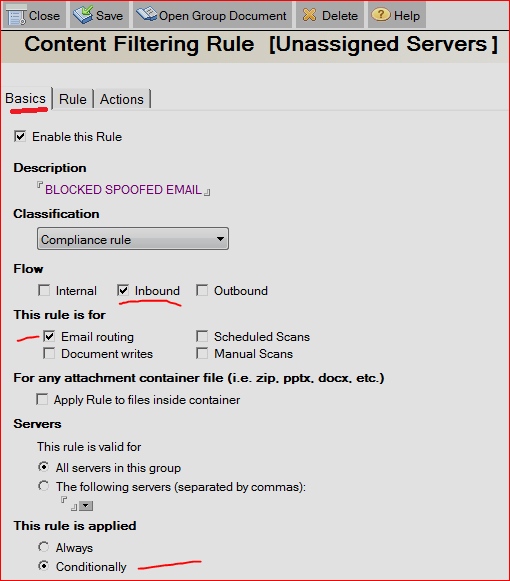 I made following rule in SMSDOM Content Filter Rules Section. 🙂 & now I can see many spoofed emails dropping in the quarantine box and user’s inbox is clean and shiny. 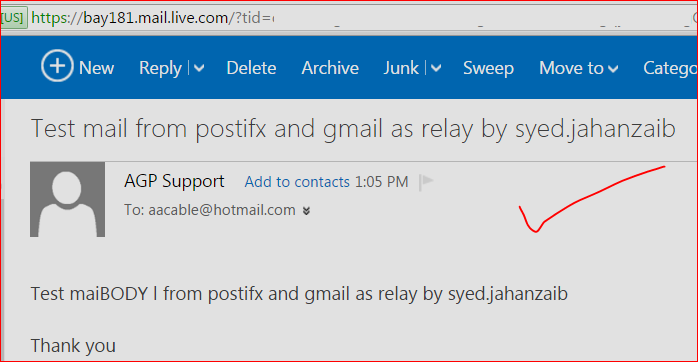 To test sending spoofed email, you can use following web site to do so .. Above record will allow all your MX records + IP 1.2.3.4 to send email from your domain, everything else is prohibited. But the mail servers or relays must support SPF protocol. whereas 1.2.3.4 , 5.6.7.8 are the Public ip address of your email server. In above image, 1.2.3.4 is primary internet link IP for email server, and 5.6.7.8 is seconday backup internet link IP , so I added both in the record.